Hello lovely readers, have you been enjoying the weather in your part of the world? I’m making the most of pleasant days filled with sunshine and am looking forward to going out more on the weekends. Speaking of weekends, I have discovered the perfect on trend weekend bag! 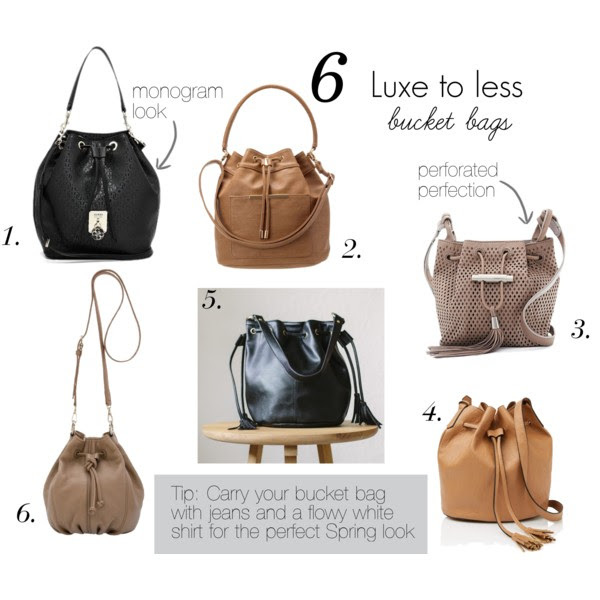 ‘The bucket bag’!! There is an array of exciting bucket bags to choose from right now. While there are a lot of colours available, I kind of like to stick with a neutral tone for this style, perfect to mix with prints or stripes. I love the boho chic feel that the tan bucket bag especially lends. Black tends to be more for the dressed up evening look. I’ve curated a lovely mix to pick from: leather, faux leather, monogram and perforated. A classic look to put together would be a white peasant top and distressed jeans with tan sandals and a tan bucket bag. Try a striped tee with culottes, slides and the black bucket bag for relaxed perfection! Have you bought a bucket bag recently? Would you add one to your wardrobe this season? Was just thinking that No 5 was my favourite – and then realised why. I have it in the pale colourway! I love all the bags but no 2 and 3 more so ! !